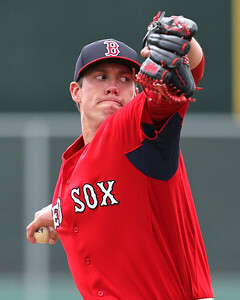 According to SoxProspects sources, Greenville Drive right-hander Pat Light has a partial tear in his right hamstring and will be out for several weeks as he rehabs in Fort Myers. The 22-year-old has already left Greenville for Fort Myers. Light, one of three Red Sox first round picks from the 2012 draft, was placed on the seven-day disabled list on May 27 with a right hamstring injury. He was activated on June 1 and started the Drive's game before re-aggravating his right hamstring after just three pitches. He was then placed on the seven-day disabled list on June 2. Currently in his first full-season in the Red Sox organization, Light has pitched 25 2/3 innings for Greenville this season, striking out 24 and walking three with an ERA of 8.06. He had a 2.37 ERA with 30 strikeouts and five walks over 30 1/3 innings in Lowell last season after he was drafted 37th overall in the 2012 draft.